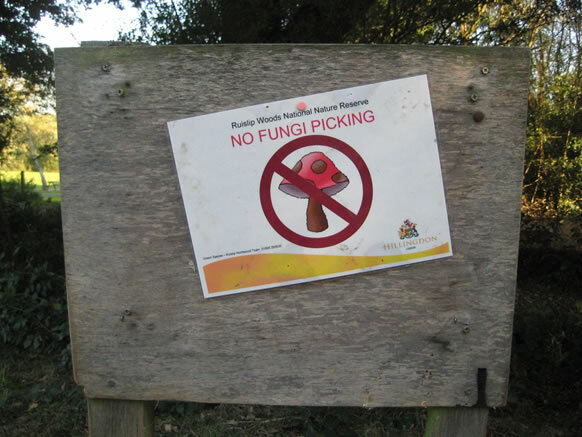 There are signs up in Ruislip Woods informing people that fungi picking is forbidden. However they are often pulled down by the public. The media encourage us to be adventurous and pick fungi, what could possibly be wrong with that ? Well firstly it is an offence to disturb or destroy any wildlife, which includes fungi, in any of Hillingdon's parks. This is particularly relevant to Ruislip Woods as it is a National Nature Reserve and is nationally important in regards to its wildlife. In Poland and much of Eastern Europe wild mushroom picking is quite normal, but in those countries there is still lots of forest and wildlife. In England this is not the case. If it was just a few people taking just a few mushrooms, it would probably go unnoticed. However, when groups of people are taking bag loads of wild mushrooms regularly from what is in effect quite a small area of woodland, it depletes the amount of mushrooms in the nature reserve and this becomes unacceptable, so we have banned any mushroom picking in these woods. The penalty in most parks for fungi picking is 80 pounds, but as Ruislip Woods is a National Nature Reserve it has special protection and the fine could be as much as 20 thousand pounds. We do have some quite interesting and rare mushrooms in Ruislip Woods and if these are left alone, then everyone can enjoy seeing them. In Britain fungi walks have become very popular as lots of people find them interesting. They are also an important part of the woodland ecology as they help break down leaves and dead wood and provide food for various wildlife of the woods such as insects and small mammals. The bylaws of the woods can be found on the back of the information signs displayed at 33 entrances to the Woods. The season of mists and mellow fruitfulness turns thoughts to mushrooms and toadstools. Fungi have a curious fascination for many people – including those with little interest in wildlife. Part of this fascination is surely due to their surprising and erratic appearances, their often interesting shapes and bright colours. These can certainly add enjoyment to a walk through the autumn countryside, particularly in woodland. But there appears to be more to the general fascination of fungi than this. Take any group of people on a fungus foray and the most frequent question is “can you eat it?” which usually means “is it poisonous?” This obsession with the edibility of fungi is curious, when you think about it. It is not the sort of question you expect to hear on a botanical walk – and plants include both edible and poisonous species. Articles and programmes in the media about collecting and cooking mushrooms and toadstools encourage this fascination with the culinary qualities of them. It is strange when one hears so much these days about the need for conservation that there is such encouragement for people to go out and pick wild fungi. Aha! I hear you say, but as long as a single fungus is left it will shed millions of spores to regenerate the species. Well, a female cod lays millions of eggs, but that hasn’t prevented the severe decline in the cod population through over fishing. The lifestyles of cod and fungi that have evolved require millions of eggs and spores for a pair of cod or another fungus just to maintain the populations. There has been concern among mycologists on the Continent for some time that over picking may be the reason for the gradual decline of fungi in many places. This year (2008) there have been more fungi to be seen in our woods than for a long time. Presumably this was because of all that rain that fell during your summer holidays (an ill wind etc….). The recent fine weather has been drying out the woods and the mushrooms and toadstools seem to be disappearing. 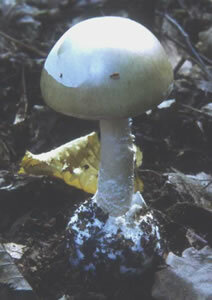 However, there are still some around to look out for, such as the Death Cap (figured) photographed in Park Wood. Incidentally, this is the species that poisoned two ladies (one fatally) on the Isle of Wight, in 2008. Even if there was no threat to our mushrooms and toadstools from collecting there remains an important reason for leaving them alone. Fungi are fascinating things and when found should not be picked but left for all to admire, in the way that one would (should) treat an orchid (which also, incidentally, sheds huge numbers of seeds). The Supermarket is the place to get (cultivated) mushrooms and toadstools for the pan, and not the countryside.